Jeff Yalden, North America’s Number One Youth Motivational Speaker, spent last week in the Greater Houston Area, mesmerizing markedly different schools, teaming up with Houston-based 91.7 FM NGEN Radio, an alt-pop and hip-hop station, which, according to its website, is focused on bringing music and a message of hope, unity and love. Monday, April 3 started with two programs at Teague Middle School in Humble, Texas, where he presented to a total of about 1000 kids. Yalden said it took about five minutes to get the kids to realize that he was legit and that he cared – and had the tools to deliver his message. He got nearly 30 minutes in each assembly, and was brought in by NGEN Radio. He said it is hard to walk into a school and do something good that the kids and the teachers like equally, but this happened at Teague Middle School. 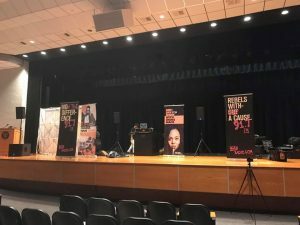 His day only half over, Jeff headed over to Summer Creek High School in Houston to deliver his message to ninth and tenth graders – and he pointed out that afternoon assemblies are usually not as effective as morning assemblies. The tenth graders were unruly and disrespectful at first, and if Yalden wasn’t a pro, he might have thrown in the towel. Each school had a dance-off with the teachers, which Yalden said was a lot of fun. Day two started out with a presentation to 300 seventh and eighth grade students at Gregory-Lincoln Education Center in South Houston, a K-8 school which includes a fine arts magnet program. 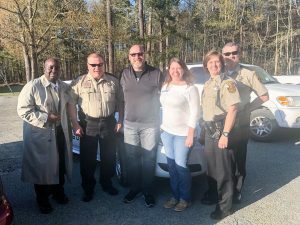 One of the administrators took Yalden outside to show him the roadway, and told him that it was a point of pride to the students and the community. “I got to thinking that this walkway is kind of like the foundation that we are built on,” he said, adding that he used a similar analogy with the kids – that our lives must be built on a solid foundation. Along with a crew from NGEN Radio, the next stop was Madison High School, once attended by football star Vince Young former Texas star quarterback and first-round pick of the Titans. Regardless, Yalden opened a Q and A session, and he said that some of the students asked some incredible questions, and he realized that some of these students really were listening. Day three blew him away when he arrived at Humble High School to present to 500 freshmen and 500 sophomores. After that talk, Yalden headed over to NGEN headquarters. “I got to meet about 100 people from the radio station. They had an app last year and just went live with 91.7 FM – and their goal was to hit 100 thousand listeners. Not even a year later, they surpassed their goal and hit just over 200 thousand. At a late morning NGEN worship service, Jeff spoke for 30 minutes to staffers. “I got to share my story about my relationship with God, and talked about how God has impacted my life to the degree that He had. It was just unbelievable,” he said. 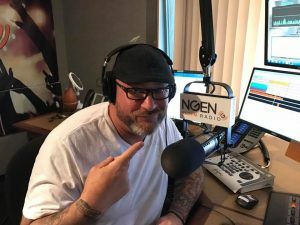 Jeff and NGEN Radio closed out the week at two schools: South Houston High School and Welch Middle School – and thanks to an intrepid limo driver – he made his flight home. “I think as a team, we got better as the week went on. We just had an amazing time,” he said. To discover more about the Jeff Yalden Experience, visit www.jeffyalden.com. Give your school event a pre-summer push. Book Jeff now by calling 800-948-9289. Jeff Yalden Delivers at Wisconsin Student Council Event in Lena, WI. By all accounts, the school district in the Village of Lena, Wisconsin is a small one – consisting of an elementary school, a combined middle and high school and an alternative school with a total population of just over 400 kids. Lena itself is a very small community. But administrators in many bigger districts with overcrowded and understaffed schools would perhaps see the incredible value in this. 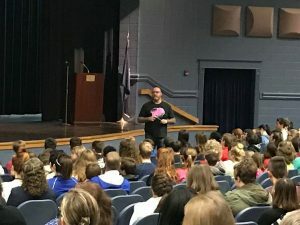 On Monday, February 13, top teen motivational speaker Jeff Yalden was on hand for a high school student council event for 47 students from 9 surrounding schools – speaking on topics from his toolbox such as personal leadership, leading by influence and the importance of believing in yourself. Yalden was impressed with a student named Josh, who displayed excellent leadership traits and unselfishness right off the bat. To Yalden, that’s what leadership is – reaching out of your comfort zone and making sure that everybody is a part of the team. “Leadership is about doing the right thing,” he said. Lunch was then served by the school’s culinary class. “They did a beautiful lunch. The food class did an incredible job of serving all of the kids and the advisors,” Yalden said. After lunch, Jeff presented a leadership-building activity that he calls “The Longest Human Bridge,” where groups were challenged to connect with each other, with very little contact with the ground. “I wanted them to understand the importance of communication and to think outside the box – to work together and to never give up,” he said. Yalden, who has has addressed more than 4000 teen audiences in all 50 states, every province in Canada and 49 countries, said the challenge he encountered with the kids in Lena was that they were very quiet. At the end of the day, Yalden spoke to the middle school and high school students from the Lena School District. Yalden has long believed that a dream will always be a dream unless it is backed up by a plan of action, and he set about to teach these students that important difference. “True leaders do not compare themselves to other people. Too many of you are willing to compromise your success for what you want right now,” he said. Find out why Jeff Yalden is North America’s Number One Youth Motivational Speaker, go to www.jeffyalden.com. To book Jeff now for your event, organization or school now, call 800-948-9289.